Abandoned: The stalled Plaza Rakyat project. ANOTHER year has passed and there seems to be much uncertainty over numerous projects in Kuala Lumpur. One of the most talked about is the plan to develop one of the oldest Malay settlements in the capital, Kampung Baru. The few changes that had been done this year were the upgrading of Jalan Raja Abdullah and Jalan Raja Abdul Aziz, as well as the drains and roads, after decades of attempts to redevelop the area. Kampung Baru is a 110-year-old settlement made up of seven villages, covering 90.2ha, with about 35,000 residents. The bulk of it is under Malay reserve land. There are about 4,300 owners. Set aside as a Malay Agriculture Settlement reserve on Jan 12, 1900, it is one of the last remaining sites in the city with distinctive Malay traditional houses and way of life. After several attempts to kick-start the plan to develop the settlement, the Kampung Baru Development Corporation Bill 2010 was tabled for first reading by Federal Territories and Urban Wellbeing Minister Datuk Raja Nong Chik Raja Zainal Abidin in December last year. The move, however, irked residents including the Kampung Baru Development Association who claimed that they were not consulted before the bill was tabled. Problems cited by the residents included the immunity of the Kampung Baru Development Corporation and representatives of the landowners in the corporation. A consensus was finally reached between the Federal Territories and Urban Wellbeing Ministry, Kuala Lumpur City Hall (DBKL) and representatives of stakeholders in June. The representatives of the stakeholders included the Kampung Baru Malay Agricultral Settlement board of management, Kampung Baru Development Association and Kampung Baru Malay Children’s Welfare Association (Pakam). Nong Chik at that time said the representatives had agreed to a comprehensive development in the area by the corporation and government-linked companies. Only after months of meetings and consultation with the residents, a new amended Kampung Baru Development Corporation Bill was tabled, debated and passed during the Dewan Rakyat sitting in October this year. The three most important issues amended in the bill were revoking the immunity of the Kampung Baru Corporation, retaining the Malay Agricultural Society and introducing a new post of deputy chairman for the Kampung Baru Development Corporation that will include a landowner. With the bill now passed, it is only expected to be gazetted by the first quarter of next year, paving the way for the setting up of Kampung Baru Corp after numerous hiccups along the way. Another project which has been in limbo is the Keramat Mall, a project that has stalled for a number of years now. The four-storey market complex with a food court, bank and post office was completed last year at RM49mil. Traders at the Keramat wet market nearby were asked to move into the new mall but they refused to do so, citing several problems. The traders were unhappy with the design of the building as well as the lots and have asked for a nearby building to house just the wet market. The project faced more trouble as landowners of the proposed building refused to move, citing insufficient compensation from Kuala Lumpur City Hall (DBKL). Recently, Nong Chik said a new deadline would be given to the traders to move. He added that the traders did not want to move because they were afraid of losing their customers, but eventually they have to move. The Plaza Rakyat is another project that’s turning into an eyesore. 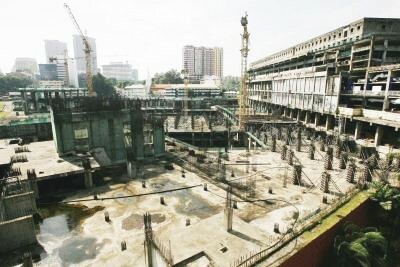 The RM70mil mixed-commercial development near the Puduraya bus station was left half-completed about 15 years ago when the developer ran into financial difficulty. Many of the buyers have pressured DBKL to solve the problem, however, nothing has been done so far to revive the abandoned project. Nong Chik had earlier said a new developer would be appointed by the Economic Planning Unit through an open tender, after the deal with the original developer was terminated. However, so far nothing has been announced on the plan to revive the project. The authorities need to come to a quick solution to solve the problems in these projects that have been in limbo for so long. With the rise of luxury property developments all over the Klang Valley, picking the next elite residential address may not just be confined to paying over RM1,000 per sq ft. While elite enclaves like Bukit Tunku, Taman U Thant as well as certain sections of Damansara Heights may offer snob appeal to wealthy property buyers, such neighbourhoods may not necessarily have everything that today's lifestyle expectations demand. For instance, iconic architecture and integrated facilities. Residential property specialist Chan Ai Cheng picks several upcoming developments that will shape up to be elite residences when completed. Bangsar South by UOA Holdings Bhd. Today's discerning property buyers, she explains, will look at developments that offer a modern lifestyle concept with a combination of desirable factors lush greenery, iconic design by distinguished architectural firms and high quality material. “The right mix of products such as an integrated development combining residential with commercial and retail property is another attraction,” said Chan. She points out that when it comes to inspiring developments, the futuristic enclave of Cyberjaya will be one of the best places to live. “Cyberjaya offers selected developments that are beautiful in concept and way of life such as the Symphony Hills development,” said Chan. Developed by UEM Land, Symphony Hills is a mixed strata project that forms part of a development spanning 98 acres. Located near the Multimedia University, UEM Land plans to build 2,865 residential and commercial units with a gross development value (GDV) of RM1bil within eight years. Touted as KL's new international trade and exhibition district, KL Metropolis spans 75.5 acres and reportedly involves a GDV of RM15bil. The project will house the new Matrade Centre and other building components. To be ready by 2016, the Matrade Centre will cover 13.1 acres while the remaining 62.4 acres would be developed in three phases over 15 years. The whole development is expected to be completed by 2025. The first phase include residential and office towers as well as a regional retail centre scheduled to be ready by 2015. KL Eco City is developed by SP Setia through its subsidiary KL Eco City Sdn Bhd. Involving 25 acres of leasehold land, the project with a GDV of RM6bil comprises an integrated, mixed-use development. It is estimated to take 10 years to complete. The master plan is by Jerde Partnership International USA in partnership with local architectural firms GDP Architects Sdn Bhd, BEP Akitek Sdn Bhd and GRA Architects Sdn Bhd. Bangsar South is another integrated, high-density development with residential and commercial properties. Besides its central location at Kampung Kerinchi next to the Federal Highway, this 60-acre development by UOA Holdings boasts of excellent Internet and transport connectivity. Launched in 2007, it will take about 10 years to complete. Total GDV is RM2.5bil.